In this session I aim to improve my goal keeper & back thirds ability to execute controlled possession into the middle 3rd of the pitch without risking possession. Try and move the ball as quickly as possible from the defensive 3rd with controlled possession. - For the #3 & #4 to find space and show for a pass on the edge of the box. - For the #6 & #8 to position themselves at angles between the lines and between the opposing forwards. 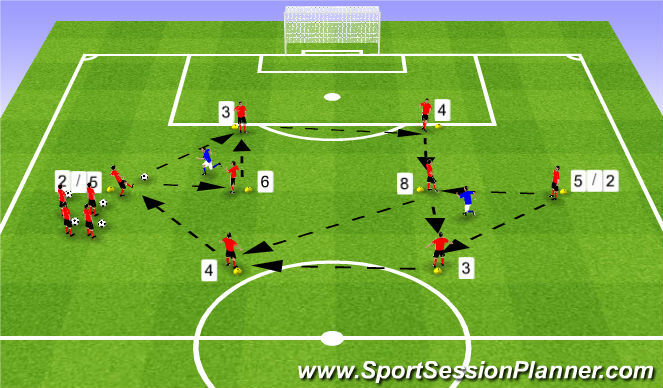 - #6, #8 & #10 to rotate positions to create left, right and middle passing options. - Look to find space between the attacking opponents and create clear passing lanes from the #3 & #4. - Watch the movement of the ball as the player takes their first touch and adjust movement into space accordingly. Instructions: Place cones to identify starting positions for players. Players are to follow their passes. Player #2 always starts with the ball. #2 plays #3 who plays #4. If the line of play is blocked by the passive defender, #2 then plays #6 who bounces #3. #3 then plays #4 who plays it into #8. If line of play is blocked by passive defender then #8 plays #3 who plays #4. Ball is played into waiting player at #2. Increase tempo, put in more balls. - Watch teammates 1st touch and position accordingly. - Shape body to be open to the pass and direction of the next pass. To introduce cues to aid back 3rd in effectively passing the ball into middle 3rd, in preparation for game training. Ball starts with #3 or #4. 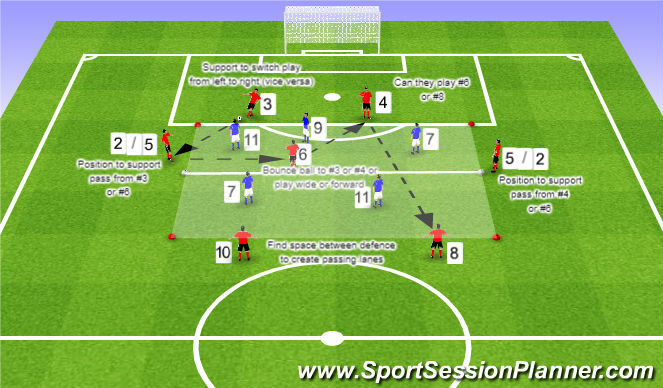 5 v 3 Positioning game. - Players on the outside plus the 6 must keep possession for as long as possible using 2 touches maximum. - The players on the inside must count the amount of interventions had in 2 minutes. - If players #3 & #4 can play a direct pass to #6 or #8 then the same game of possession continues on the other side of 5 v 3. The #7 & #11 plus one more player from the grid must join to have a third player trying to get the ball. Red: To get the ball to other side without risking possession. Blue : To intercept and disrupt possession. 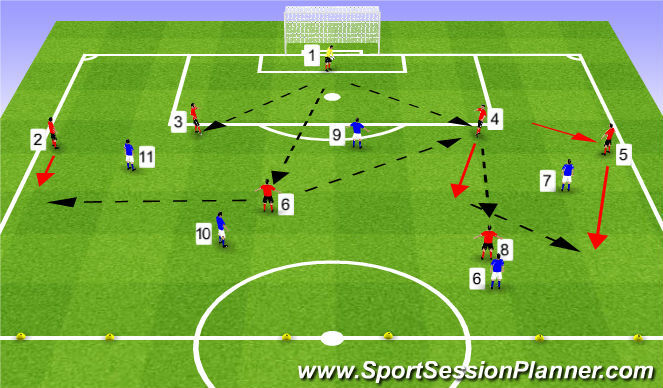 - Players on the outside must count the amount of passes it can make from end to end in 2 minutes. - For players on outside of grid (#2,#3,#4,#5,#8,#10): to ensure quality of pass (accuracy and pace), match realistic movement on and off the ball, and keeping team shape and combinations as per philosophy. - Players inside grid (BPO): (#7,#9,#11) – Keep lines small, and realistic. Stop as many passes as possible. - Player in grid: (#6) BP – to ensure quality of pass (accuracy and pace), match realistic movement on and off the ball, and keeping team shape and combinations as per philosophy. 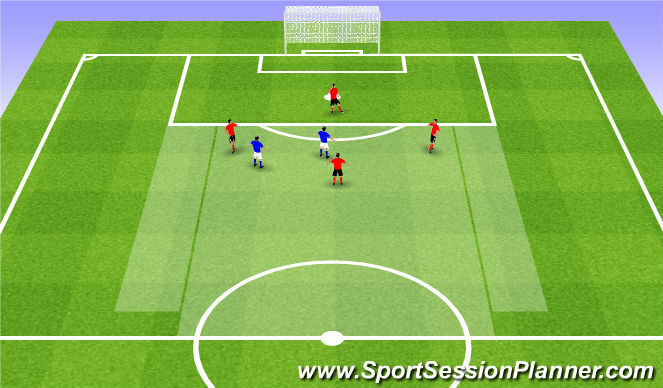 - Players (#2,#3,#4,#5,#8,#10): Starting position in relation to the ball – ‘When the ball is in a position to be played, can you put yourself in a passing lane’. Support ball whenever possible. - #6 when the ball is with #3 or #4, can you get yourself in a position to be able to bounce out to #2 or #5? - #3 & #4 can you play direct pass to #8 or #10 if possible? - #7,#9 & #11 can you disrupt opposition defence, by blocking passing lanes, intercepting passes. Start / Re-Start Method: The game starts with Goalkeeper. Red team - To dribble the ball over the halfway line with 5 metres of the nearest opponent. Blue team - To score as quickly as possible. Blue team has 15 seconds to score! To get a back four players into the middle third in controlled possession. - All – When GK has the ball, make the field as big as possible. - Try to receive the ball in a way that you can immediately play forward pass with good ball speed to move opponents out of positions. - Provide information to team-mates of opponents positioning as well as your own. - Can you get yourself into a passing lane & recognize the moment to ask for the ball. - #1 Play direct ball to midfield if possible. Support the ball by providing a line of pass and taking up a position to receive in time and space. Try to switch play as much as possible. 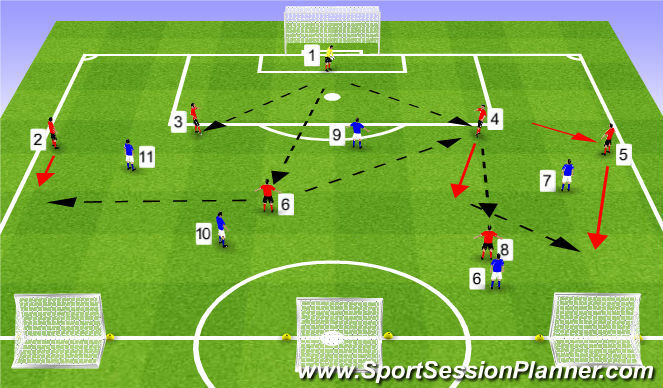 - #3 & #4 when the GK has the ball, position yourself level and outside of GK to optimize space. Use the GK to switch across the back-line if forward pass is not on. When you pass to #2 or #5 drop and provide a supporting position so they can play back if needed. Try to draw the 9 to one side and switch play. If you have eliminated the 9 and have space in front, travel forward with the ball. - if pressed by #7 or #11 can you play the ball into #6 or #8 to bounce out to free fullback #2 or #5. - If pressed by #9 and you cant switch play to the GK or full back, can you pass to the #6 or #8 so they can bounce out to the other centre back, or turn forward. - #2 & #5 when the goalkeeper has the ball, position yourself sideline wide and just past the shoulder of the #7 & #11. Try to move the #7 & #11 back to create space for the #3 & #4. - If the ball is with the other full back, slide across to provide cover. If the ball comes central, get wide again. - If #3 or #4 are pressed by #7 or #11 drop off to support to bounce out to the free fullback, or turn. Team Blue: Shoots in the main goal.